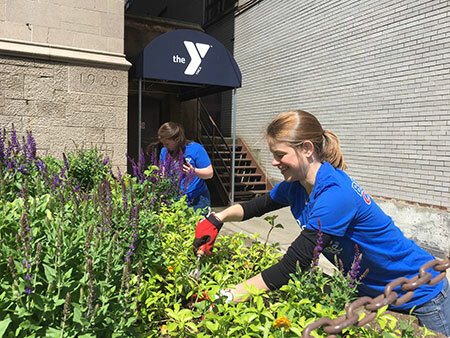 In Westchester County, NY, Berkeley College volunteers planted flowers and applied mulch at the YMCA and Gilda’s Club Westchester, both in White Plains, and also repacked donated food items for families in need at the Food Bank for Westchester in Elmsford. 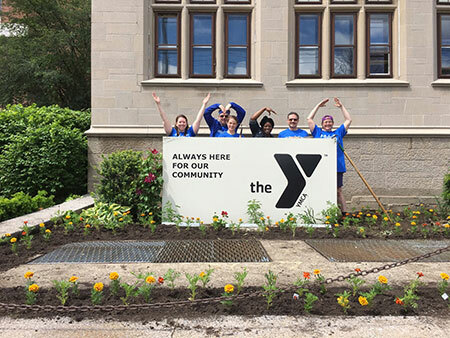 Photo Caption A and B: Berkeley College volunteers plant flowers at the White Plains YMCA in White Plains, NY, as part of Community Service Week, held throughout the week of May 21 to May 26, 2017. FiOS1 News spoke with Michael J. Smith, President of Berkeley College, while he volunteered with Berkeley College staff and students at the Food Bank for Westchester on May 23, 2017. Click here to watch the news segment. “Community Service Week at Berkeley College helps build awareness about the role nonprofit organizations play in keeping our local communities strong and vibrant,” said President Smith. Photo Caption C: Berkeley College volunteers repack donated food items for families in need at the Food Bank for Westchester in Elmsford, NY, as part of Community Service Week, held throughout the week of May 21 to May 26, 2017. Click here to watch FiOS1 News’ story about this.